When it comes to travel, packing is my nightmare as it is for many of us. It literally gets me stressed. Is it gonna be warm and sunny?! Is it gonna be windy and, even worse, will it rain and ruin my outfit mood?! Yeah, I did say before I love the winter, but it's a rainless kind of one. And I tell you a secret. A weird thing about myself. What stresses me out the most is the feeling that I might lose some of my favourite pieces on the way. So I never take what I really need and, worse than that, what makes me feel like I'm walking in heaven. But I'm actually working on that and I can see some progress. As the summer is here, the packing time is just around the corner, too. So I decided to give you some tips. 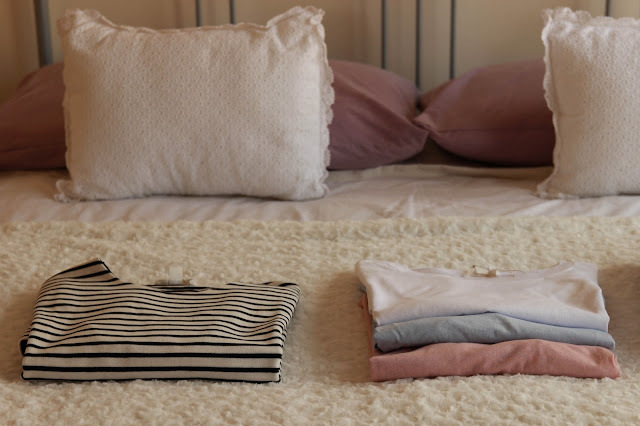 Tips I'm using myself so that packing isn't a nightmare anymore. To make everything easier I pack classic essentials that can work on a broad range of occasions. So a good pair of jeans as well as a perfect shape shirt are always in my off to go case. I also try to go for basic clean patterns. Pieces that can go with everything. Monochromatic colours are always a choice. Black and white can take you anywhere but I must agree that during the summer period a bit of colour and light is welcomed, too. This time, my choice is that famous pastel shade power. Pastel is just inevitable this season. It's like a fresh touch in our wardrobes. Tiago complains about my black and dark blue dressing addiction. So I guess my blue and pink pastel basic tee just saved my life. At least for now. Basic t-shirts give us a relaxed look as well as a modern elegant shape when matched with the right garments. A simple pair of culottes or basic black pants are the winners and also indispensable in any suitcase this summer. They make the perfect outfit on any occasion. A cardigan is also a must take. Despite the summer mood, we always welcome a cardigan when the evening rise starts. I always go for a black or a navy blue one, so that I don't need to worry if it's gonna match the rest of the outfit look. When it comes to shoes, you all know the answer - TRAINERS. I even use them when I need to dress up for a dinner occasion. They are kind of my uniform. Everyday piece. No matter what, they make me feel comfortable and elegant at the same time. So if I have the perfect pair of trainers, I don't need anything else. But my last investment was actually these special Teva Sandals. They are just a thing. Besides going perfectly well with any bottom piece, they even remind me my walks across the river when I was a little child. Shout out to my lovely parents who made me wear them. And it was kind of difficult at first, but I'm happy they didn't give up easily. I can't take them out these days. Thanks to them. Last but not least, I always bring my iPad and my notebook. To make me feel as if I'd never left home. I use my iPad to stay up to date on my favourite blogs and to check what's new coming from my favourite brands. My notebook? Well, that's where I keep all my simple thoughts, next to my endless to do list. Carefully organised which makes me feel safe. And as you might all agree, a fashion magazine is always a good company, too.